The last few weeks have been so crazy for my family. After looking for full time work for over a year, my husband was finally blessed with a great job in Asheville (where I have really wanted to live). The same week I found a part time job and we moved. It has all happened so fast that it hard to believe. We are so blessed and grateful! I haven’t really had much time for cooking lately and unfortunately we have had to eat out a lot, but now I am getting back in the kitchen. Creamy Tomato Basil Soup was one thing that I did cook in the midst of moving. I made a giant pot of this soup and then we ate it for days. This is definitely a quick easy meal that is delicious and makes great left overs. 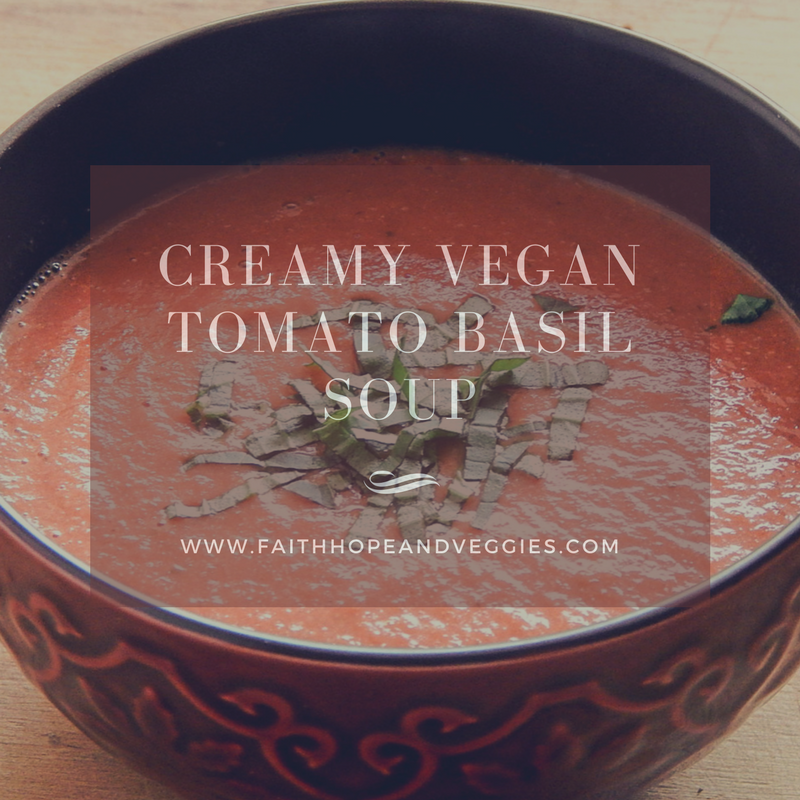 This soup just reminds me of summer and its a great way to use fresh basil from the garden. 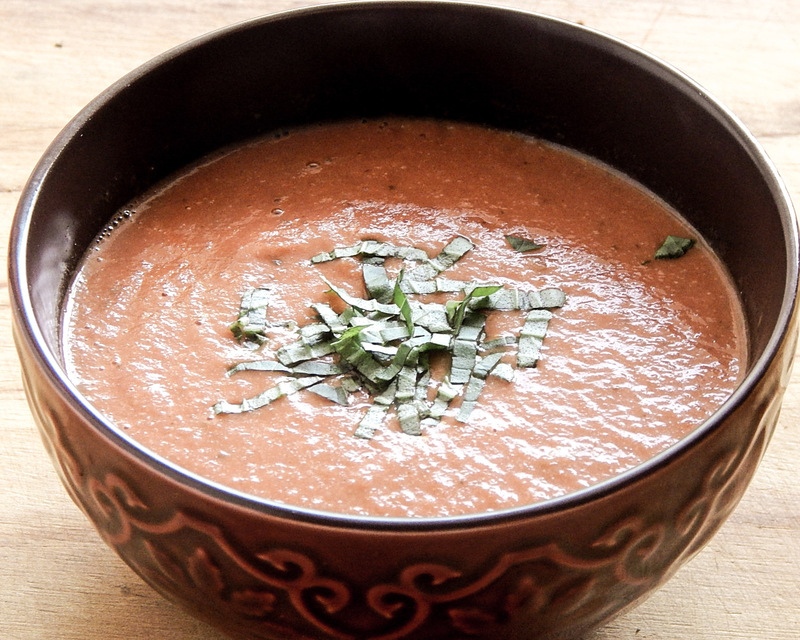 The creamy part of the tomato basil soup is made with raw cashews. To make the cashew cream just soak raw cashews for at least 2 hours before blending them. Cashew cream can be used to replace dairy cream in almost any recipe. I usually blend the soup, but you can always leave it chunky. I love to serve it with a really nice loaf of bread for dipping into the soup. Drain the cashews and place in a blender with 1 1/2 cups water. Blend until smooth and creamy. In a large soup pot heat the olive oil. Add in the onions and cook for about 5 minutes. Add in the garlic and cook for another minute. Add in the tomatoes and the broth. Bring up to a boil then turn down the heat and let it simmer for about 15 minutes. Add in the basil, salt and pepper. Simmer another 10 minutes. Turn off the heat and then add in the cashew cream. If you want it smooth blend with an immersion blender or in batches in a standing blender. Serve the tomato soup with a fresh loaf of bread.